1,000 Cap for Nurses has been reached | Federal Skilled Worker Program - Gateway to Canada | Canada Immigration Consultancy! 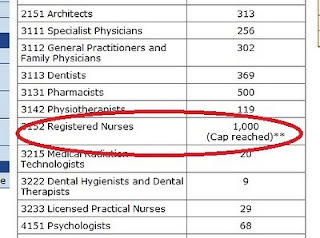 As of December 22, 2010, the 1,000 cap for Registered Nurses has already been reached. This means, the Centralized Intake Office will only accept applications for this occupation from people with an existing offer of arranged employment. Otherwise, it will be returned unprocessed. I'm a registered nurse and I don't have an arranged employment. But I meet the 67 points pass mark. I'm in the middle of preparing my supporting documents, WHAT NOW? Now isn't your time, but make sure when your occupation opens up again, you will be ready to file your application in an instant. Your time may come this July 2011. Go ahead, get your documents ready as early as now! It is not impossible that the cap for nurses will be filled up in a month or two after it open up. It will be a huge mistke if you will miss that opportunity again.